We love our dogs - Beamer and Sebastian. I have a thing for short fat dogs. And big dogs. Opposites, I know. Really, I just love dogs. Always thinking to the future, I already know what our next two dogs will be. I don't want to think about when that will be because then it means that we won't have Beams or Sebastian with us, but I must be realistic. Dogs are dogs. They have limited life spans. 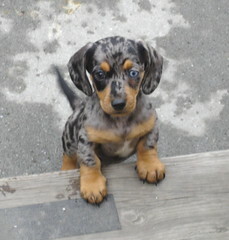 This is a dappled Daschund. I want one SO BAD. I love the ticking, as well as the combination of grey, black, and tan. In addition, Jake and I also very much want to get a Harlequin Great Dane. We will need to be fully established as grown ups because great danes eat a lot. We'll need a lot of money in the Pet portion of our budget. For now, though, we are in love with our boys and are as happy as can be.